You may have noticed I went to Milan a couple of days ago to witness the 2018 San Pellegrino Young Chef Competition and to support David Wälti who was competing for Switzerland. A little bit about the Young Chef Competition: 2018 was the third edition of this cooking contest which allows young talents from all around the world to present their signature dish to a high-class jury of 7 world known chefs. Each contestant had around 6 months to prepare for the competition and for this they have been assigned to a mentor. 21 competitors, 21 mentors, 7 jury members and 1 signature dish per contestant. my usual content and -as I previously said on my IG stories- now I know that I'm not a food blogger and do not consider myself as one, but my content is about lifestyle and as I am a big big fan of food, this was a great occasion to be able to share with you a different experience. On Saturday was the first day of the competition, the young chefs were divided in two groups, the first one was cooking and presenting the dishes on Saturday and the rest on Sunday. We arrived at Superstudio on Saturday morning in order to meet David (the young chef representing Switzerland), be able to discuss a little bit with him about the competition, his expectations, etc. We got to meet a 30 years old man who was definitely looking like he was in his twenties, very nice and humble, when I asked him about the competition and whether or not he was stressed about it, he simply told me that he was focused, ready to show what he has been preparing himself for and confident in his ingredients and recipes. He told me that he grew up in a farm in the German speaking part of Switzerland and actually wanted to faithfully recreate all the countryside vibes and the tastes he was used to have during his childhood. I guess this is one aspect of Swiss people that I really appreciate, most of the time they are very humble and modest individuals, not bragging about what they have or know. David and his signature dish were really corresponding to these values and it was really nice to witness and support such a genuine and unpretentious performance. I discovered some very strange tools while observing the chefs cooking, some of them brought some very specific ones from their own countries so they would be sure to prepare the best food possible. For example, one of them brought with him a machine -which has a very complicated name (that I obviously forgot)- just to be able to extract the juice from his beetroots and make sure that there were absolutely pesticides free. We had a lovely lunch organized at the Superstudio and cooked by the two chefs Chicco Cerea and Davide Oldani. This menu bas absolutely delicious and what to say about the desert.. not only was it beautiful but it also was really delicious ! The little green crumble you see around the apricot-looking cake is basil flavored sablé, de-li-ci-ous ! In the evening we went to a cocktail organized at a place called The Garage and during which we got to meet each other.. I mean we were so many ! Journalists, corporates, food bloggers, influencers, clients etc, it was one big and happy crowd, very eager to be able to be part of this great experience. Eheh I guess you know me now guys, we got up super early in the morning to squeeze a little improvised photoshoot and a quick walk around the Duomo and the Galleria, their beauty never ceases to amaze me ! If you want a nice picture in this area I definitely recommend getting up somewhere between 6.30 am - 7.30 am so that you avoid the incredible crowd that gravitates around these very touristic places. On Sunday it was finally David's turn to cook for the competition ! We went to Superstudio to support him and watch the jury savor his realization. His dish looked absolutely amazing, very natural, pastel tones, lots of tasty herbs, fresh fish, crispy vegetables.. perfect ! We discovered the amazing Villa Necchi Campiglio is a very famous residence in Milan, it is one of the principal art déco realisation in Lombardy. We had dinner in the villa's huge greenhouse and let me tell you, it was magical ! I didn't take a lot of pictures of the villa's interior because it was already late in the evening and the lighting wasn't good enough to get nice pictures. The interior has been remarkably preserved, all the furniture pieces, the artwork, tapestries, etc are originals and you can really dive into another century when entering this incredible house. 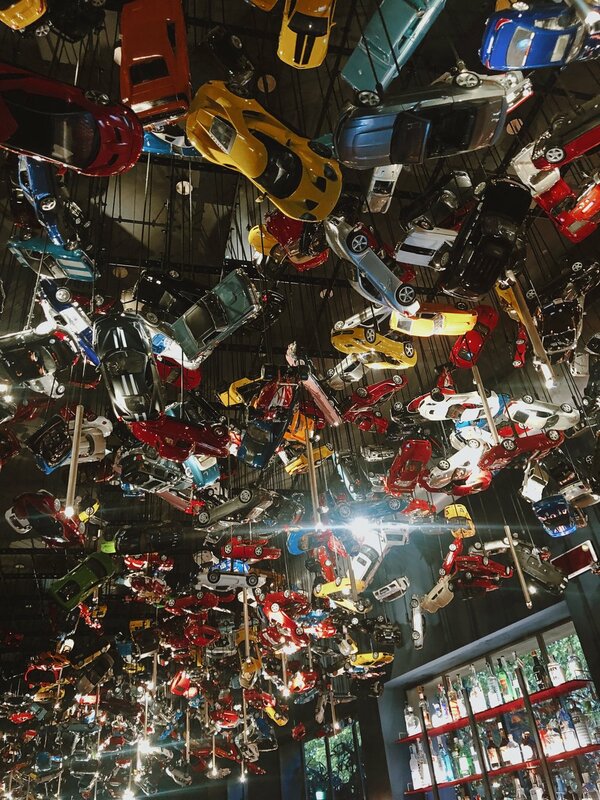 We are back at Superstudio for an incredible pizza lunch ! World's best pizzaiolo Franco Pepe and his team prepared the best pizzas ever for us ! I was genuinely so excited about this part, it's not every day that you get to taste the best pizza in the world ! All the tables set up were always so pretty ! I don't know about you guys but I appreciate so much a nice table. We then headed to the show, basically presenting all the young chefs and their dishes, the mentors and the jury, summing up a little bit these two day of competition and also the final choice ! There were three prices to win, the incredible Japanese young chef Yasuhiro Fujio won two of them thanks to his amazing technique skills and great inventiveness. It was really touching, Japanese people aren't used to express their feelings and he was really shy, seeing him win those two prizes and being congratulated by pretty much everyone was really touching. David was actually amongst the 7 finalists guys ! We were super proud of him and his team, even though he didn't win the competition he definitely did an amazing job. I was so surprised and happy because they had Tom Walker coming and singing for us ! He's such a great singer and his performance just added some extra sparkles to this extraordinary evening. During the evening we had the incredible chance to taste the jury's chefs cuisine, they cooked for us some delicious appetizers and were serving us themselves ! This little green bowl was imagined by chef Massimo Bottura, I'm such a big fan of him, he's a great man and an amazing chef. The following of the evening was simply magical, the jury's chefs were also behind our amazing Gala dinner dishes ! Chef Dominique Crenn was in charge of the starter, Chef Annie Féole of the main course and Chef Virgilio Martinez of the desert. The desert was absolutely delicious, you know me, I've got the biggest sweet tooth ever so desert is definitely the most important part of the dinner. Okay so here it is guys ! 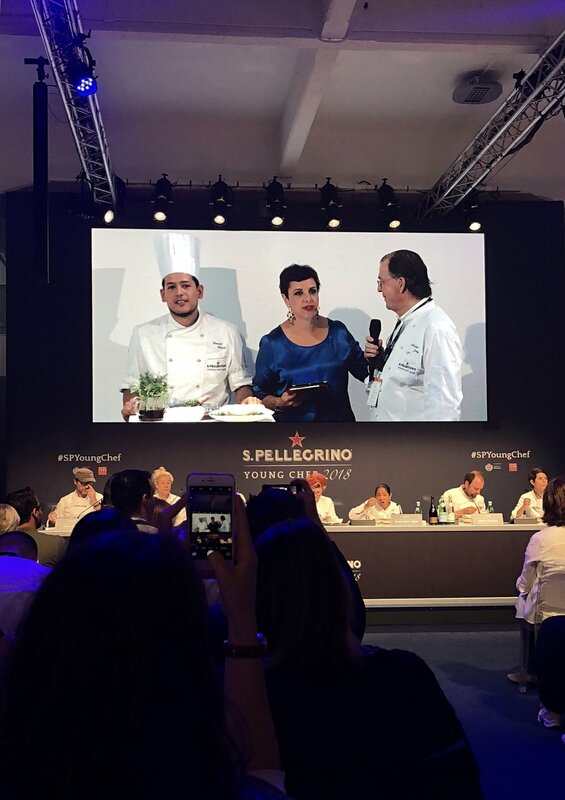 A little recap of my three days in Milan with San Pellegrino for this third edition of the Young Chef Competition ! I hope you enjoyed reading about it, I am always so happy to be able to experience so many different things, get to meet great people around the world and most of all: share all of it with you !